Amit Frisch Beit Hayeled in Jerusalem became "home" for Shirelle Cohen. Born in Israel and raised in Fair Lawn, for the last three years 21-year-old Shirelle Cohen has lived at a Jerusalem therapeutic foster-care facility for 120 children. "This place became my home," says Cohen, who decided after the first year not only to move to Israel permanently but to choose AMIT Frisch Beit Hayeled as her home base. It is not uncommon for young people to opt for army service when they make aliyah to Israel, but Cohen's path is less well-traveled. When she was a student at Ma'ayanot Yeshiva High School for Girls in Teaneck, like most other American graduates of Jewish high schools she began searching for a gap-year program in Israel. "I knew I wanted to spend the year in Israel, but I wanted something extra beyond intensive learning," she said. "My parents are Israeli, and every summer I come to Israel. I wanted not to be in an American bubble but to fully live Israel to the max." So when Midreshet AMIT's director made her presentation at the area high schools' joint Israel Night, Cohen knew she'd found her match. Midreshet AMIT students live at Beit Hayeled and take classes throughout the day. When the foster children return from school in the afternoon, they come home to the surrogate family units in which they live with Israeli married couples — 120 5- to 15-year-olds divided among 10 couples the overseas students help care for them and play with them. "Moving to Israel made me see what is truly important in life," Shirelle Cohen said. "That was really up my alley: kids, Israelis, learning, and chesed" — charitable work — and I gravitated to that," said Cohen, so she headed off to Midreshet AMIT in the fall of 2010. "It was one of the biggest, most important decisions I ever made. That year changed my life." 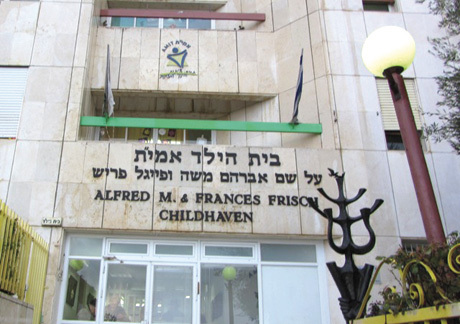 Whereas many students in Midreshet AMIT struggle with the language barrier in their interactions with Beit Hayeled children, Cohen's fluent Hebrew allowed her to become especially close with her assigned group of 12 and their foster families, and to assist her classmates with their own young charges. "These kids are damaged from all they have been through, and it can be overwhelming for the [American] girls coming here." Back in Fair Lawn to visit during Passover 2011, her feelings crystallized. "It was clear to me I couldn't wait any longer to start my life in Israel," Cohen said. "I had been planning to go to Stern College. But after living with these kids who had been physically and sexually abused, neglected — and understanding the extent to which I can help — that's what made me want to make aliyah. What could I possibly offer in America that was similar? These kids need me way more." Her parents, Haim and Rachel, fully supported their daughter's dream. She booked an August 25 Nefesh B'Nefesh charter flight from New York, and went back to Jerusalem to finish the program and figure out her next step. Each surrogate family has two Israeli National Service volunteers — young women just out of high school — to help them each year, so it seemed logical for Cohen to apply for this position. However, each of the 20 slots for September had long since been filled by the time she inquired in June. "I started checking out other places, but not wholeheartedly because I couldn't imagine separating from the kids at Beit Hayeled," Cohen said. Before she left for the summer, she begged Beit Hayeled's director, Motti Asraf, to be in touch if anything changed. "He promised to do whatever was in his power," she said. From Fair Lawn, Cohen emailed Asraf every week. "It was nerve-wracking, because I had no idea where I was going when I arrived in August," she said. "I have a grandma in Israel and I thought I'd go stay with her until I figured out what to do." As her departure grew near, she wrote Asraf a long email about how the year had made a profound impact on her. No immediate answer came back. "My parents and I were freaking out," she said. "Then, three days before my flight, I received an email from Motti with the subject line 'Mazal tov!' He said I could be on the [National Service] team for that year. It felt like an actual miracle." Asraf had forwarded her email to the head of the AMIT educational network, who authorized a 21st slot at Beit Hayeled especially for Cohen. She was to rotate to each surrogate family, filling in for volunteers or parents who were sick or on vacation. "Instead of 12 kids, I had 120 kids," she said. She also helped match Midreshet AMIT students with appropriate family units, drawing on insights from her close relationship with each group. Whereas the other National Service volunteers went home for Shabbat and holidays, Cohen stayed on campus. "It was my home," she said simply. "I had the most amazing year of my life. I didn't think anything could get better." It did, though, when her two older brothers, Etan and Jesse, also settled in Israel. One is a financial consultant and the other a strategy consultant for the government. In June 2012, the director of Midreshet AMIT asked Cohen to return the following year as the seminary's head counselor. She would live with the seminary girls, assist with needs, and plan events and trips. Cohen, a seminary girl herself just a couple of years earlier, would be a sort of older sister to the girls. "Because this would be full time with the seminary and not with Beit Hayeled, it was hard for me to make the decision," she said. "But I decided to stay on, and again it was one of the best decisions of my life." She discovered that remaining on campus also was beneficial for the children. They were used to having each Midreshet AMIT and National Service volunteer around for a year or two at most. "And all of a sudden, they had me there for three years in different capacities," she said. In that time, she also got to know several of the birth parents; their children were in Beit Hayeled because the government had removed them from their homes. "I learned that some of the parents are good people who made poor decisions," Cohen said. "And it made our relationship that much closer because they appreciated that I left the 'perfect world' in America to move here and help their children." Cohen now has begun college, studying management and marketing at the Jerusalem College of Technology (Machon Tal). Not willing to part with her, the Midreshet AMIT staff persuaded her to continue her job on a three-day-a-week basis, as the first bilingual liaison with Beit Hayeled, officially assisting the seminary students with their assigned children. But she is dorming at Machon Tal. "I'm easing my way out of Beit Hayeled very slowly," she said. "I literally felt like I moved from my home and it was difficult for me. Had I come to Israel without Beit Hayeled, I don't know how it would have been for me. It made my transition to Israeli society so much easier. Strangers became my family and held my hand." She feels that Beit Hayeled is in her future, though she is not sure in what capacity. "Moving to Israel made me see what is truly important in life," Cohen said. "I've matured and transformed. Had I not moved to Israel, I would have been a different person today. "Looking back, I am thankful to my family and God because I am happy with the person I am today."